Image caption Ms Park said South Korea could not afford to lose "one second"
South Korea's President Park Geun-hye has warned that the country is facing "unprecedented" political deadlock which is hampering economic progress. 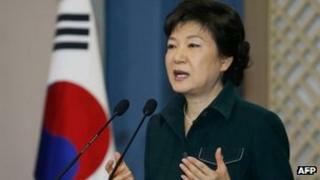 Ms Park was sworn in as president last week, but has not yet been able to form a cabinet. She has failed to reach agreement with the opposition over her plans for reorganising the government. They say plans to move the media into a new ministry would effectively put broadcasting under state control. In a televised address, Ms Park apologised for the deadlock, saying it had "caused serious delays to state affairs" and was "unprecedented since the country's founding". She dismissed the Democratic United Party's claim that bringing the media into a new Ministry for Planning and Science was a move to control broadcasting. "There is no other purpose than to strengthen the country's competitiveness by creating a new growth engine and improving the people's lives by creating many good jobs," she said. ''We are in an urgent situation, and we cannot afford losing even just one minute or one second,'' she said, referring to South Korea's struggling economy. She also said South Korea was at "crisis level", following the recent underground test by North Korea of a nuclear device and its launch of a three-stage rocket, both of which were seen as a breach of UN resolutions and condemned as a threat to stability in the region. The debate between the DUP and Ms Kim's Saenuri party has become uglier as it has drawn on, says the BBC's Lucy Williamson in Seoul, with many of those who oppose her plans reportedly accusing her of trying to force the bill through and behaving in an undemocratic way. There is already a spotlight on how Ms Park handles herself in power, our correspondent adds, because her father - also a former leader of the country - was a military autocrat who suppressed the pro-democracy movement. Park Geun-hye: Can the new president fix South Korea's economy?